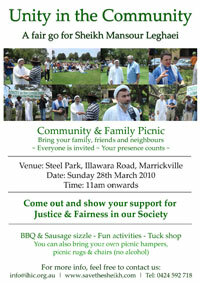 Join us on Sunday March28th for the Unity in the Community BBQ – calling on our government for a fair go for Sheikh Mansour Leghaei. This is a chance for all of Sheikh Mansour’s supporters – Muslims, Christians, people of other faiths and people of no specific faith – to come together to express their concern for the man and his family. Festivities will be held at Steel Park (Illawarra Road, Marrickville) beginning at 11am and continuing until 4pm. Sausages will be provided, courtesy of the Imam Husain Islamic Centre but you can equally bring your own picnic (but NO alcohol please). Download the full-sized poster by clicking here. Print it and post it up in your school, church, mosque or office. Having submitted his formal appeal to the Minister for Immigration, Sheikh Mansour Leghaei has broken his silence and spoken openly to Lateline about his concern for his family and his ongoing hope for justice. The Canterbury Torch and Valley Times publish “Forced Out“. Father Dave speaks on his relationship with Sheikh on ABC’s The Drum.